Two Mothers, Part 2 | Why Kan't Doc Zoe Write? Not long after pronouncing the pre-term baby, an 18-year old mother was brought into the delivery room. Angelica was silent but in obvious pain. She was red and shedding tears while she endured each excruciating spasm. As minutes passed, Angelica abandoned all inhibitions and screamed. By the time the baby’s head was showing, Angelica was already so restless and motioned getting off the delivery table. What moved us was that she kept screaming “Jeremiah” from this moment forth. Every push had her screaming that name, which reverberated throughout the operating room complex. It was quite touching that despite all pain, she still longed for her husband to be on her side and drew strength from him. 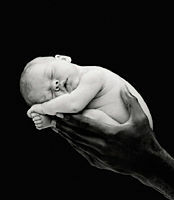 Image from Anne Geddes which I got here.